Thank you for supporting HDpiano, we’re always listening to you. Before sending us a message, please read our short FAQ section below. Why do I need a credit card or PayPal account to start a free trial? Can I download the sheet music or MIDI files for your lessons? I completed my order. How do I view the members-only videos? I am having trouble logging in. How can I fix this? I just want to learn one song. Do you have an option for me? As a subscriber to HDpiano.com, you get exclusive streaming access to four times as many videos as our free YouTube subscribers. This includes all of the ‘part 2, 3, etc.’ videos for every song. If you’re interested in learning full songs from HDpiano, becoming a member is the only option. Additionally, our video player features tools like speed control and looping for desktop and mobile that aren’t available on YouTube. Just to clarify, our 30-day free trial is absolutely, 100% free. You get unlimited access to our song lessons just like a paying member from Day 1. We require a valid payment option to ensure that once the free trial is over, you’re capable of paying for your full subscription. It’s your way of showing that you are seriously interested in our service, even if you don’t decide to pay for it. We create corresponding sheets for our lessons that are located in a link on each lesson page. Musicnotes is the exclusive vendor of these sheets- they manage the legal essentials that allow us to include these sheets on HDpiano.com. A discount code for paying subscribers can be found next to each sheet link. MIDI files are currently unavailable for sale or distribution. First, are you sure you’re logged in? Ok, good. Did you complete your order within the past 15-20 minutes? If so, please give us a few minutes to receive confirmation from PayPal or Stripe in order to activate your subscription (it shouldn’t take more than 20 minutes). Finally, if you’re still having trouble, there is a chance that your order didn’t go through properly. Visit the My Account page and login to your account. If your subscription status is “Active” or “Processing” you should be good to go. If it is “Pending” that means that your order did not go through. Cancel the “Pending” order, and please try checking out again. Many login issues are caused by using the wrong username. Your username is the first half of your email address. For example, if your email address is “hdpianorocks@hdpiano.com”, your username would be “hdpianorocks”. If you’re having trouble logging in on a video page, you can login directly on the My Account page. If you can’t remember your password, you can always reset it here: Reset Password. If you’ve tried all of these steps and still can’t login successfully, please contact us below and provide your username (and order number if available). If you truly only want to learn one song from our vast library, we’d recommend utilizing the monthly subscription option and canceling when you’re finished. But we’d love to have you around for a few more songs! You can change the status of your subscription at anytime by visiting the My Account page and logging in to your account. If you have an active subscription (“Active” or “Processing” status), you can simply click “Cancel” to stop your automatic payments and cancel your subscription. If you cancel before the end of your 30-day free trial, you will never be charged a penny. Similarly, you can renew your cancelled subscriptions at anytime as well. Our basic stance is that we have “a no refund policy”. We offer a free trial to our subscription so anyone can try out the site risk-free to see if they like it or not. If a customer is not satisfied, we expect that they will cancel their subscription within 30 days, before their 1st payment. With that said, we don’t want anyone paying for our service who doesn’t truly want it, so if you contact us within 7 days of your subscription payment, we’ll happily refund your payment. Let us know what you’d like to learn by voting in our requests database! You can submit something new or add your vote to an existing request. Fast, simple, fun! If your question still hasn’t been answered in the FAQ above, please send us a detailed message below. We offer a free trial to our subscription so anyone can try out the site risk-free to see if they like it or not. If a customer is not satisfied, we expect that they will cancel their subscription within 30 days, before their 1st payment. With that said, we don’t want anyone paying for our service who doesn’t truly want it, so if you contact us within 7 days of your subscription payment, we’ll happily process a refund. Please provide as much relevant account information as possible if this is concerning the account of a friend or family member. This will help expedite your request. This means your payment failed to process. This usually happens when a credit card or bank account on file with PayPal has expired. 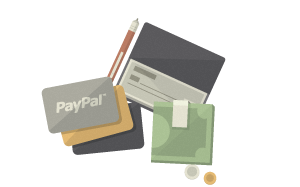 Make any necessary changes in PayPal, cancel your previous subscription, and sign up again here. If you were unable to sign up again or have additional questions, contact us with details here. You can cancel your account by clicking "My Account" from your user menu. Under "My Subscription," click "View" and then "Cancel." To ensure that the cancelation is reflected with PayPal, visit this link, click your subscription, and press "cancel." You will still have access through the end of your subscription period. Let us know if you have any trouble with this by sending a message here. If your question hasn’t been answered above, please describe your problem in detail and we’ll respond within 24 hours. Many login issues are caused by using the wrong email address or password. Try other possible addresses or passwords before contacting us. Your assigned password was emailed to the address you signed up with when your account was created. If you can’t remember your password, you can always reset it here. If you think you didn’t receive the reset email, check your spam folder and follow the link in the most recent recovery email. If you’re still unable to reset your password, contact us here and we’ll respond within 24 hours. Try a different browser- we recommend Google Chrome or Safari. If videos won’t load on any browser, try a different device to confirm your access. If you are able to access videos on another device, please contact us with information about the failed device and we’ll look into it.